Many people keep horses as pets. But according to Steve Bowers and Marlen Steward, both horses and owner actually get more pleasure out of having a job to do, whether it is pleasure driving, harness racing, or pulling a load of hay. 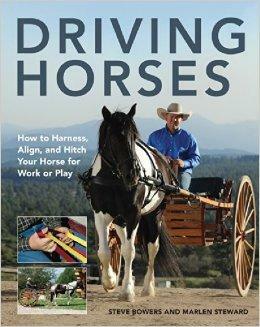 Driving Horses, an essential reference, shows you how to get the most out of your horse's power while establishing a relationship of confidence and trust. Learn how to hitch your horse to an implement, how to maintain correct lateral and longitudinal alignment, how to use various harness and collars, and more. Step-by-step color photos show you how to accomplish all these tasks quickly and efficiently.